I’ve always been a hot dog girl. As a kid I never chose the burger. To this day I’m not a sports fan, but you can take me to a ball game as long as we can enjoy some hot dogs and beer. Of course I love me some farm-raised pork hot dogs in lamb casings, hold the nitrates. But I’ll detour for Grey’s Papaya and I’ll wait in line at Nathan’s with the best of them. I’ll take any old dog off the grill with mustard, it’d be great if you could toast the bun. I do draw the line at dirty water dogs – I’m sorry but a hot dog floating in the same old water all day just doesn’t tempt me. Have I mentioned I love hot dogs? This weekend Brad and I drove to a family party in Pennsylvania. A family reunion of sorts where we celebrated my great uncle’s birthday, spent time with my grandma, caught up with cousins, aunts and uncles, ate too many cookies and played some good old lawn games. On the way home we thought we should break up the 5 hour drive with a destination of some kind. We contemplated outlet shopping, but of course we decided on a food pilgramage. We considered a trip through Pennsylvania Dutch or Amish country for a farm-to-table experience, but after a quick Road Food search, I was convinced a 40 mile hot dog detour was our best option. 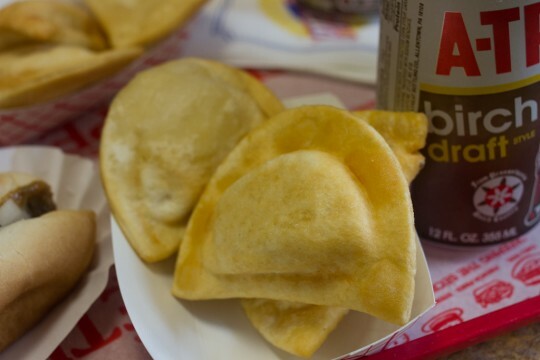 They had me at fried pierogies – that’s right, fried pierogies. 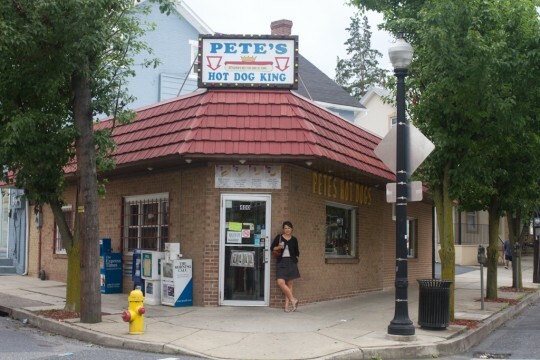 Our destination: Pete’s Hot Dog King in Bethlehem, PA. I feared that we would arrive to the disappointment that is a closed sign (it was Sunday afternoon), but we were greeted by two cheery young girls at the counter and proceeded to order our lunch. 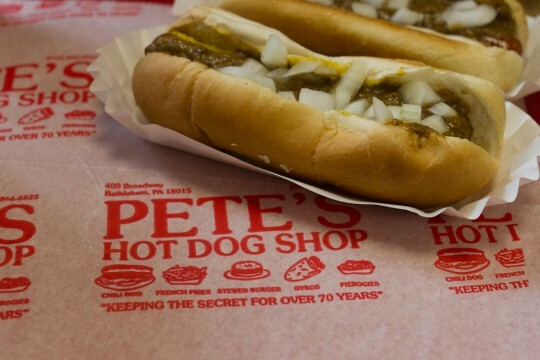 The menu: Hot dogs, house-style with mustard, chili and onions, fried pierogies and A-Treat birch beer soda, locally bottled by the Pennsylvania Dutch since 1918 – and you thought they only made pretzels. I left smiling, with the memory of chili dogs and the taste of fried cheese and potato pierogies lingering in my mouth, telling Brad, “you know this place is only an hour and a half from Brooklyn according to the GPS”. Did I mention I’m a hot dog girl?